Calzedonia Verona were dangerously close to shock Cucine Lube Civitanova in Game 1 of the 2018/19 Italian Men’s Volleyball Championship playoff quarterfinals. After clinching the first two sets against No.6 Calzedonia Verona, the players of the third seed Cucine Lube Civitanova certainly could not imagine they will go through hell to get the lead in the 2018/19 SuperLega Credem Banca playoff quarterfinals. Lube saved two match points in the tie-break to win by a 3-2 (32-30, 25-20, 22-25, 23-25, 18-16)! Cuban Yoandy Leal with 28 points (three aces) and Bulgarian Tsvetan Sokolov with 27 points drove Lube to the victory. 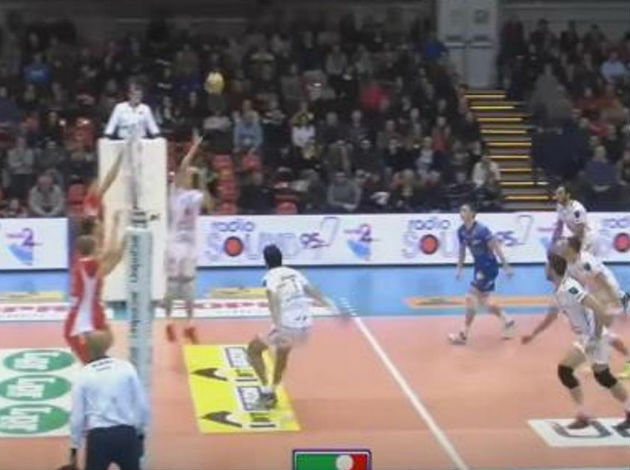 Sokolov’s compatriot Matey Kaziyski noted 22 points (four aces) for Verona. Itas Trentino and Sir Safety Conad Perugia also began the Italian league playoffs on the right foot. Being still emotional after conquering the 2019 CEV Volleyball Cup, five days ago, the players of the second seed Itas Trentino swept Kioene Padova in Game 1 of the 2018/19 SuperLega Credem Banca playoff quarterfinals. Thus, Trentino came one step from advancing to their fifth consecutive SuperLega semifinals. A little ceremony was held prior to the encounter against Padova, as Trentino players presented a recently won CEV Cup trophy to their fans at the BLM Group Arena. As for the match, Serbian Uroš Kovačević top-scored for Trentino with 13 points while Davide Candellaro made 75% first tempo attacks. Canadian Ryley Barnes put down 11 points for Padova. The top seed Sir Safety Conad Perugia were ruthless at home against No.8 Vero Volley Monza, winning in straight sets thanks to 15 points from Cuban Wilfredo León and 73% attack from Filippo Lanza. There were no double-digit players in the squad of the 2019 CEV Challenge Cup runners-up.